Posted January 17, 2017 by Louis Rabinowitz & filed under Opinion. Imagine a show like this. It’s set in an infinitely complex sci-fi sandbox in which countless amounts of planets, dimensions and alien species co-exist. Our guide to this universe is a somewhat irascible, wacky older man who’s an expert on everything the vast and terrifying universe has to offer. And to ensure that the man in question isn’t bored, he brings along a younger companion who provides a more relatable and innocent perspective. Together, they travel throughout space and time, getting into scrapes while they juggle a life in regular old modern day suburbia. But also imagine that the older man is wracked with existential horror at the knowledge that he’s completely irrelevant in the vastness of the universe, and destined never to reach happiness, which manifests itself in alcoholism and wacky catchphrases that translate as ‘I am in great pain, please help me’. Imagine that the companion is that man’s grandson, who has been forcibly coerced into adventures while his regular life withers away. And imagine that those scrapes involve not constant invasions of the Daleks or Cybermen, but instead include the slow invasion of sentient dogs, a trip into a microverse whose whole existence is to power a car battery, and a journey inside a dead, disease-ridden body which involves a battle against Hepatitis A and B.
Suffice to say, Rick and Morty is both everything and nothing like Doctor Who. It channels the relentless imagination of Britain’s seminal sci-fi show, supercharged by a gleeful lack of restraint provided both by the show’s late night shot and animation format that means that on this show, literally anything is possible. Some of the concepts that this show cooks up are astonishingly inventive in their own right, bursting with so many weird and wonderful new ideas that the show could easily coast after its pre-titles scene and ride on the imaginative elevator pitch it cooks up for each episode. Except, of course, this is not a show that’s ever been known to coast, and its ambition has only grown as it’s pushed the boundaries of its format and its structure. What starts as a simple sci-fi comedy in the pilot has metamorphosed by the second season finale into something brilliantly layered and complex, yet still retains that basic spark of imagination that got it off the ground in the first place. 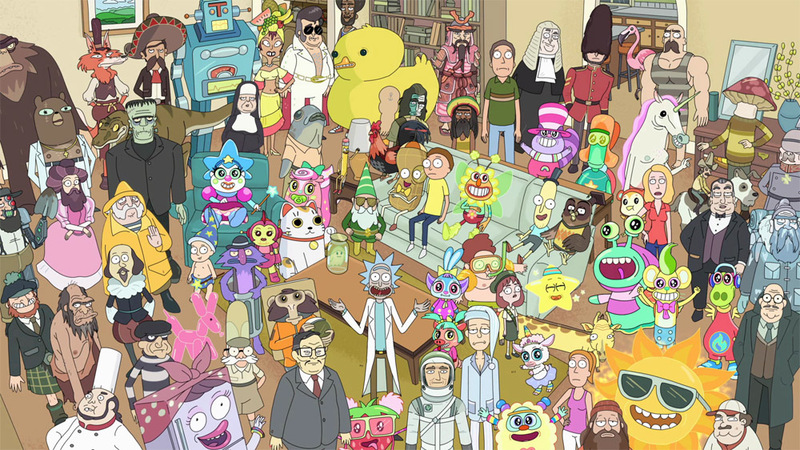 It’s important to note that, above all the thematic and dramatic flourishes and experiments show’s co-creators, Dan Harmon, is most famous for creating the fantastic cult sitcom Community, and that show’s razor-sharp, densely funny dialogue easily transfers to Rick and Morty, augmented by the flurry of quick visual gags that the animators sneak into almost every frame. 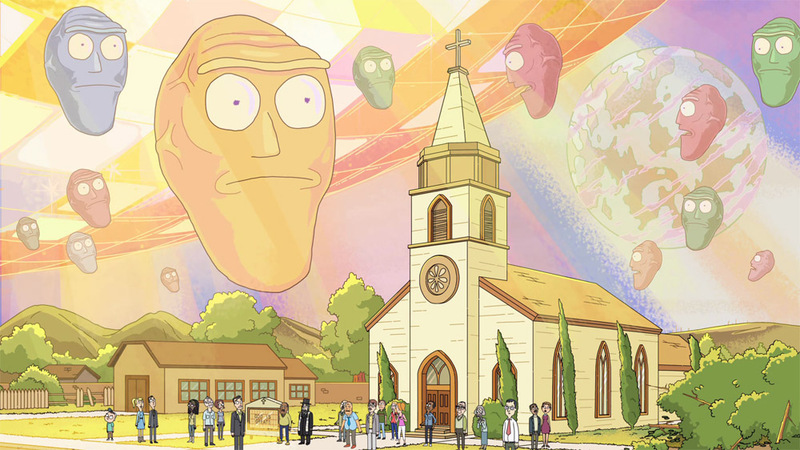 The aforementioned sense of imagination comes into play constantly when it comes to the show’s comedy, too, ensuring that Rick and Morty always finds a new and surprising way to make you laugh, whether it’s with a weird, psychedelic musical number or channel flipping through alternate dimensions’ TV. Thematically, too, it’s a show that soon latches onto some fascinating ideas to ensure that the experience goes deeper than just providing a consistent flow of humour. Sartre and Nietzsche might seem like weirdly highbrow reference points for a seemingly silly animation, but their ideas of existentialism and the constant struggle to find meaning within a vast universe fit perfectly within a world where the characters are constantly more species and places beyond their perception. It’s also where an interesting point of divergence with Doctor Who comes. That show is preoccupied to a fault with the idea that Earth is special – the number one destination for both the Doctor and the hostile aliens lurking in space, looking for a decent planet to invade. 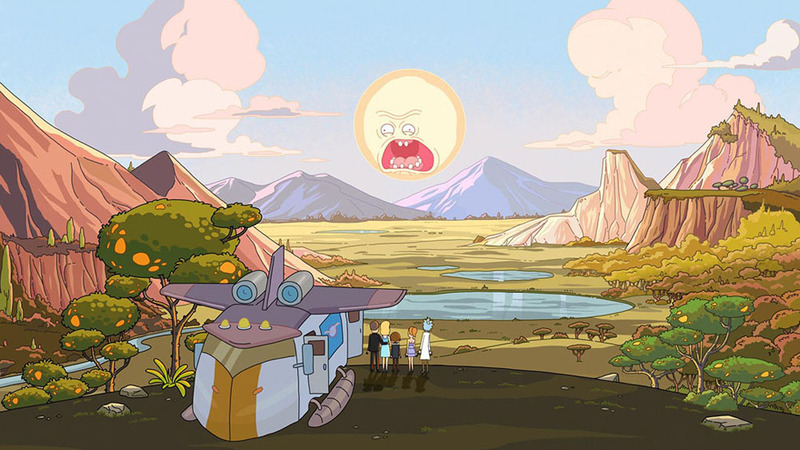 Conversely, in Rick and Morty, Earth is nothing special at all. It’s just one small planet, described constantly to be primitive by other species, and the characters who are preoccupied with their lives on Earth above all, like constant object of humiliation, Jerry, are portrayed as hopelessly naïve and functionally irrelevant in the grand scheme of things. People like Jerry might care deeply about their own hopes and dreams within their lives, but Rick and Morty makes it abundantly clear time and time again that the universe does not reciprocate. Rick and Morty may seem like two shows in one. But while it’s true to say that there are certainly episodes that are mostly just light-hearted adventures, the dark, frightening undertones of the characters’ irrelevance always finds a way to creep up on them, and in some episodes, it becomes inescapable. In this respect, Rick and Morty snugly fits into the recent glut of tragicomedies whose humour hides an underlying a sense of despair and fear such as BoJack Horseman, Fleabag or Kimmy Schmidt, possessing the same uncanny ability to blend tones that would seem to be polar opposite into a satisfying and coherent whole. With Rick and Morty on the way back this year after an excessively long break with season three, now is the perfect time to dive into the unrestrainedly imaginative, insightful and relentlessly funny sci-fi that you never knew you wanted. Both seasons of Rick and Morty are now streaming on Netflix UK. Buy Season 1 on Blu-ray on Amazon here.